Das Radio ist total Scheiße. Habe es für 15,00 Euro bei einen Secound Laden gekauft. Das Problem. Es kommen 3 AA R6 Batterien rein. Aber die funktionieren nicht und klemmen im Gerät. Es können nur AA R6BE von Panasonic eingelegt werden. Diese Panasonic R6BE , BE muss es sein. Und die gibt es nur im Internet. Das ist total Scheiße !!!!!!!!!!!!!!!! Mám ten samý rádiobudík, ale v?bec nehraje. Nemáte n?kdo servisní manuál, nebo aspo? schéma (schematic diagram) tohoto rádia ? Rádio nehraje, ale hodiny jsou vpo?ádku. I got the same alarm clock, but did not play. Does anybody have the service manual, or at least diagram (schematic diagram) of the radio? Radio does not play, but the clock is right. 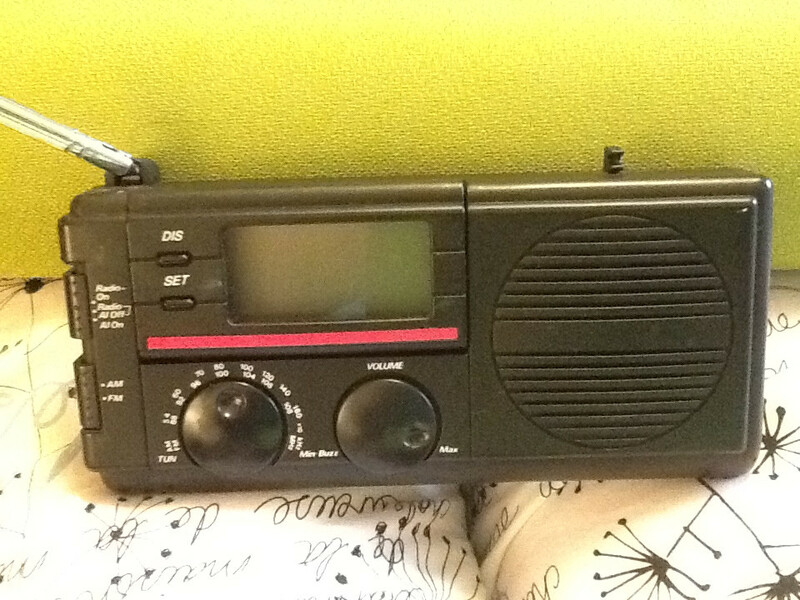 I have one of these radios. It still works great. I just can’t figure how to set the clock. Holding the set button does nothing. Holding both buttons does nothing as well. Does anyone know? The lady who had the radio was kind enough to just give it to me. I will take better photos and see if a small writeup can be done. Excellent, Paul! We look forward to it. I’ll post it for you. I have no idea how it performs; a local seller has it for sale. After staring at the photo for some time, something in my head tells me it _could_ be a DAK radio. Remember those radios? Some were pretty good, some were not, but most had case/cabinet designs that were not like the mainstream portables of the day (Sony, Grundig, Radio Shack, etc.). Just my thoughts. Pretty interesting-looking radio, by the way. How does it perform? I agree, Steve. It looks DAK-esque for sure. They produced so many radios, but I’ve never actually owned one.